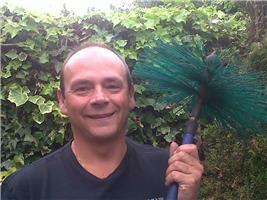 David the Chimney Sweep - Chimney Sweep based in Portslade, East Sussex. I am an independent chimney sweep based in Portslade, East Sussex and cover the Brighton and Hove area as well as along the Sussex coast from Worthing to Newhaven and 10 miles inland. I am fully insured and all chimneys swept are issued with a chimney sweeping certificate. For more information about these services please feel free to contact me. All the areas I cover are listed below. Brighton, Hove, Ditchling, Hurstpierpoint, Keymer, Lancing, Newhaven, Peacehaven, Portslade, Rottingdean, Saltdean, Shoreham-by-Sea, Southwick, Steyning, Woodingdean, Worthing and everywhere else within a 10 mile radius.